Familiar with the story of Greyfriars Bobby, the Skye terrier who presided over his master's Edinburgh grave for 14 years? 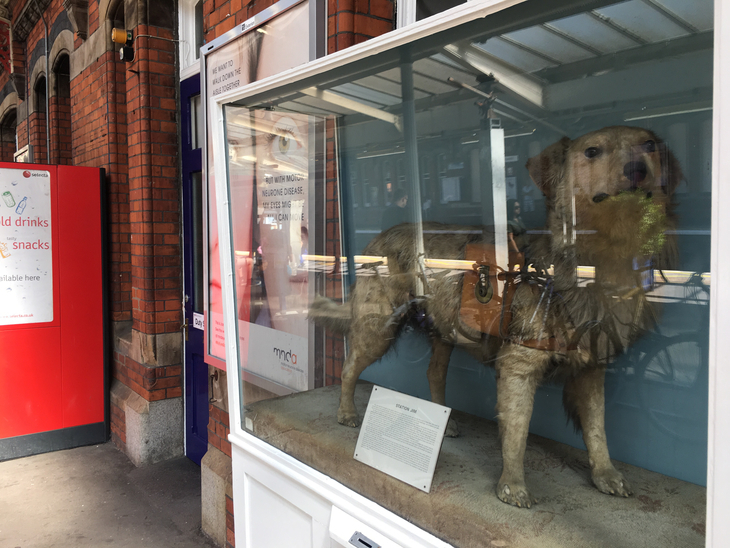 London has its own charming story of a dedicated dog, although in this case, the furry hero couldn't stay away from his beloved Euston station. In the days before it was a giant 1960s bath, Euston (and many termini across the country) employed 'collection dogs'. These were particularly erudite pooches, who would charm passing commuters, thus encouraging them to cough up for charitable causes. Birmingham Daily Gazette, Saturday 13 December 1924 With thanks to Trinity Mirror. Digitised by Findmypast Newspaper Archive Limited. All rights reserved. 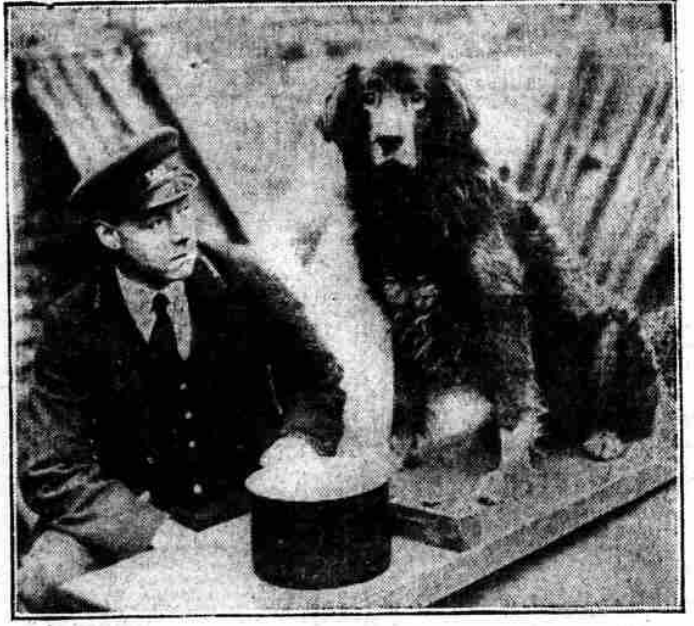 Brum's successor was a cross collie called Roy, who, again, gained a brace of VIP admirers in the form of the royal couple, and collected more than £3,100 in his seven years' service — a significant amount in those interwar years. But when it was time for Roy to retire, he didn't much fancy it, and despite being put up in a good home with a retired railwayman, the dog continuously found ways to escape — seven times no less. "Roy Refuses to Retire" reads a Birmingham Gazette headline from 13 December 1924, explaining how he was discovered at a different train station each time, apparently still trying to collect money (bless). Sensing they were beaten, the staff at Euston finally allowed Roy to relocate to his old kennel, as the next door neighbour of new collecting dog, Rags. 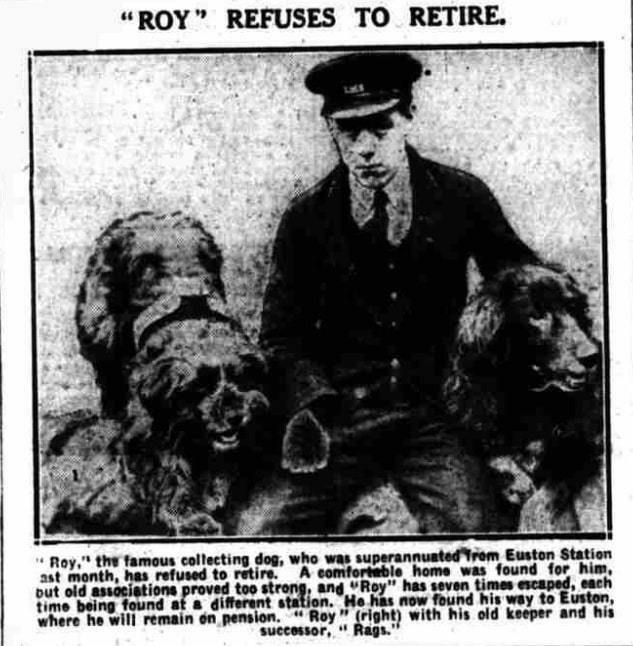 And so Roy lived out the rest of his days here on a "liberal pension of meat and dog biscuit", passing away in October 1925. Some of the railways' collection dogs were so beloved, they were stuffed and kept on display at their former workplace. Tim — an uppity Irish terrier, who according to 'Amazing Dogs' favoured rich, well-dressed passengers over the poorer — could be seen in a taxidermied state in Paddington station as late as the 1960s. Visit Slough today, and you'll still be greeted by Station Jim. He's been at the station — alive and then not-so-alive — since 1894.